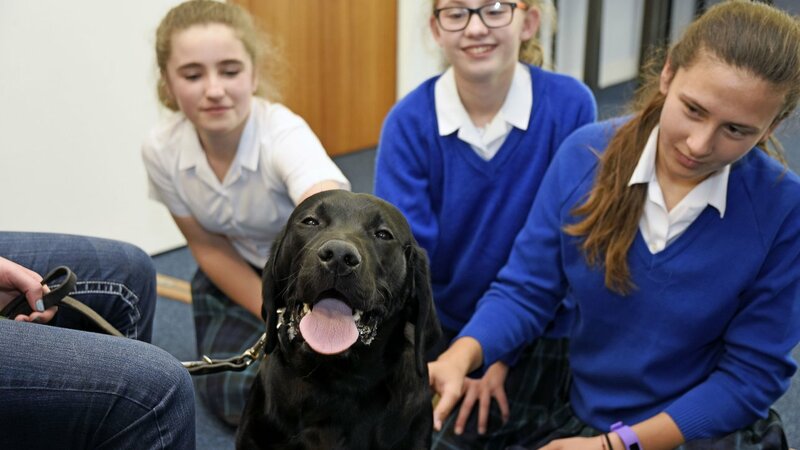 Girls have enjoyed the company of some very welcome canine visitors (and their handlers) from The Guide Dogs for the Blind Association, who were on hand to help relieve stress for those taking mock exams. The Guide Dogs are one of the Head Girls’ chosen charities for the year alongside Myton Hospices. The visit was one of many activities the Sixth Form Leadership Team have arranged over the past year, with cake sales, fancy dress days and a charity ball all helping to raise funds for the Leamington based charity. The Kingsley School have had a long running connection with Guide Dogs, with one alumna commenting that she remembered supporting the charity back in the 70s. The Head Girls, who will be soon finishing their headship to focus on A-level exams, aimed to raise enough for the school to name a puppy. This amount has now been raised, with suggestions for the puppy name currently being considered by students and staff.